As a blogger, I get a dozen or so emails a week wanting me to check out this product or mention that company. I received an enthusiastic email the other day from a guy who wanted me to take a look at the dog sleeping bag he invented. I liked this guy’s attitude so I thought I would check it out. If those of you who have been reading my blog for a while haven’t guessed already, I will admit it. I am a gear snob! I’ve seen a dog sleeping bag or two. Quite frankly, they are no more than glorified dog beds made out of sleeping bag material. They’re not something I would buy or use except for novelty. I’ve worked over 10 years in the outdoor industry so I know a well made, quality piece of gear when I see it. 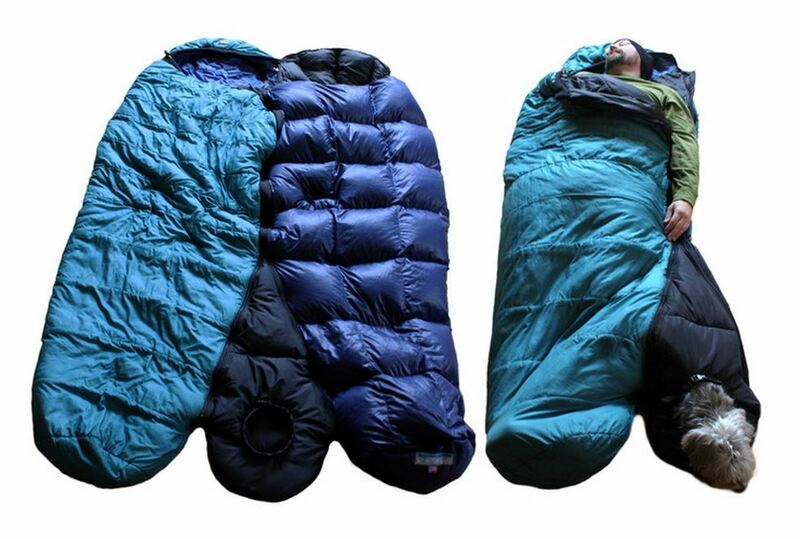 This sleeping bag, my friends, is genius! My dogs are small so I can fit them inside my mummy sleeping bag when we camp but its a REAL tight fit. Not too get too technical on you but when the sides of the sleeping bag are stretched to capacity, the stuffing get’s flattened out. It’s the air pockets within the stuffing that provide the insulation needed to stay warm. Flattened sleeping bag insulation means that it doesn’t keep you as warm as it should. The Barker Bag is more like a sleeping bag appendage. It zips into the existing zipper of your sleeping bag and creates this extra sleeping compartment to accommodate your dog. These aren’t just for small dogs either. They come in different sizes to accommodate medium and large dogs. 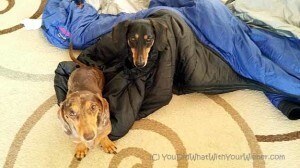 Chester and and Gretel are more than happy to crawl deep in my sleeping bag and stay there but this dog sleeping bag is made with a hole for your dog to poke it’s head out. I could see Chester or Gretel wanting to stick their head out if they wanted to be warm in the bag but still keep an eye out for treats. When we are all inside the bag, I can stick my foot out of the hole when it gets too hot too! This genius dog sleeping bag is not available to the public yet though. It’s only got a few days left on Kickstarter and it’s not funded yet. If this is something you could see yourself using, or you just want to support Seattle guy trying break into the corporate dog camping market, please visit the Barker Bag Kickstarter page and back them. The deadline to pledge is Tue, May 6 2014 5:00 PM PDT . By the way, the inventor was nice enough to loan us a medium Barker Bag to take on our upcoming road and hiking adventure trip. Check out our announcement to see where we are going! Looks like an awesome bag! I think my dogs would love it too! Thanks for the review! That looks really cool! I’m impressed! This is such a neat idea. If we camped, I’d definitely make the investment. There are so many people trying to enter the pet market and few who come up with a unique idea. I really like this one. Oh, wow, this is awesome. I love this. We are definitely taking this to market! The design is absolutely unique, and is backed by USPTO utility patent. I know that once some folks get to try it out, it will succeed! Thank you, Jessica for giving us a shot! What a cool idea!! You’ll have to tell us how you like it!! Can’t wait to follow your trip! I’ve got 2 golden retrievers, so they only need extra insulation during winter camping. For winter camping I usually just zip each one into an old summer bag (we have one designated for the dogs). It’s not a mummy bag but the dog that camps with me in winter has never gotten out to wander. They (and I) don’t feel a need to be attached to each other over night. It’s a neat idea; I just don’t have a need for it. Yeah…it is certainly not for everybody. If you have a small to medium dog with short hair, that gets cold at night, and likes to snuggle, this is a great product. 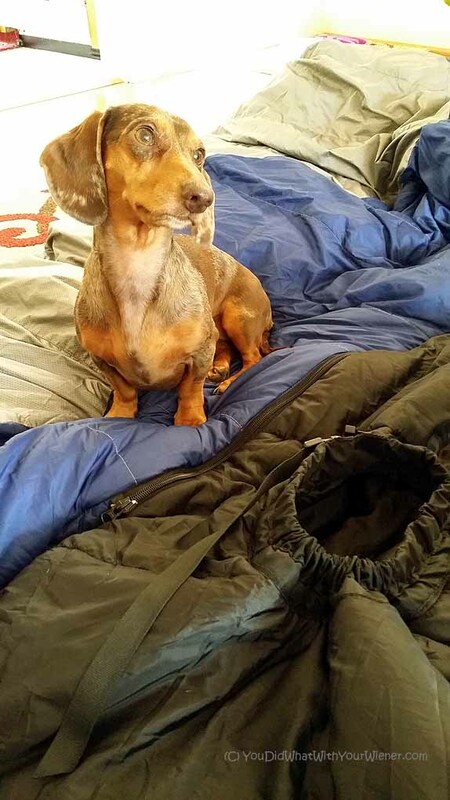 If your dog doesn’t normally sleep in your sleeping bag, has long hair to keep it warm, or is over 70 lbs (the biggest bag size), then this is probably not for you. Thanks for checking it out though. That’s such a great idea! At least if you have calm and well behaved dogs – I think Alfie would probably wrap us both into some sort of tight cocoon if we tried one though 😉 See you at blogpaws! So I realize this post is a year old, but I just stumbled upon this post while looking for reviews of this product. I was wondering what your experience was with the Barker Bag. 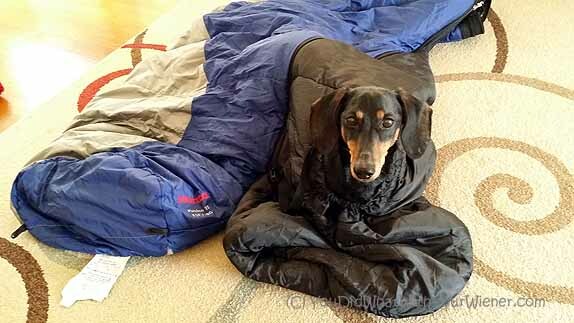 Did it hold up well, did it zip to your sleeping bag securely and still keep you warm, did the dogs like it? How small does it pack down? Thanks! Hi Shelby. Thanks for stopping by. People often read my older posts and I always monitor the comments and reply. While I have slept outdoors with the Barker Bag zipped into mine, I have not taken it backpacking. I didn’t experience a noticeable temperature difference with it zipped into my bag. It was very secure too and can be used to couple the zippers of two sleeping bags (when one is a right and one a left) together so the dog can sleep between you. I didn’t take it backpacking because 1) we didn’t go much last year and 2) my dogs are small enough that, although I liked it, I would rather tuck them inside my bag than carry the extra weight. I never put it into a compressible stuff sack so I can’t say the exact dimensions. However, I would expect it to compress as much as a synthetic sleeping bag would. The compressed size/volume would depend on what size bag you purchased. I appreciate the response. My mummy bag is pretty snug on me, so there’s not much room to fit a pooch into the bag without compressing the insulation, and I hate to buy another down bag that’s big enough to fit them and me in the same bag. They normally like to burrow and sleep by my legs, but on a recent trip they adamantly refused to go into the bag, probably because it was so tight. Fortunately it didn’t get too cold, and we had extra layers with us that we used to throw over the pups. The weight is also my concern. The medium Barker Bag weighs almost as much as my whole sleeping bag. You’ve definitely given me food for thought. Thanks again!